How do you get a browser without a browser? "I'll just launch a browser and download Firefox. Er..."
How do you install a browser when you don't have a browser? The news that Windows 7 won't include Internet Explorer in Europe has caused an outbreak of head-scratching - especially among those of us whose routers need a browser window to configure our connections in the first place. So if boxed retail copies of Windows 7 won't come with a browser, how on Earth are we going to get online? Microsoft hasn't offered any detail, but according to VP and deputy general counsel Dave Heiner "we will offer it separately and on an easy-to-install basis to both computer manufacturers and users." In practice, that's likely to mean one of the following. If we were betting types, this is the one we'd put our money on. Technically, a second disc in the box means that Windows 7 doesn't include Internet Explorer because it's no longer built into Windows or part of the Windows installer. Microsoft would be sticking to the letter of its decision rather than the spirit of it, which would be a rather Microsoft thing to do. 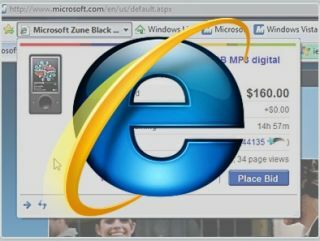 Rather than putting IE in the box, Microsoft could do an AOL and fill computer shops with free Internet Explorer CDs. The extra packaging would increase Microsoft's costs and wouldn't be great for the environment, but who cares about polar bears when there's the EU to thumb your corporate nose at? Putting a Download IE icon on the desktop or sticking it in the Welcome screen to launch an FTP session would again enable Microsoft to ship IE without including it in Windows, but we're not convinced about this one: on a bare install on a new machine, you'd need to get your net connection configured before it would work - and if Internet Explorer is really stripped out of Windows, removing Windows Explorer's online powers, you wouldn't be able to do that. The same applies to putting IE in Windows Update: if you can't get your connection running in the first place, IE might as well be on the moon.